To ensure that the email we send you ends up in your inbox, and isn’t mistakenly sent to the junk folder, please whitelist our email address, which is execed@wharton.upenn.edu. Below is information on how to whitelist us with Gmail, Outlook, and Apple Mail. Even if your ISP or email program is not listed, with these instructions you should be able to figure out how to whitelist our email address at any ISP or with any email program. Also, if you find email from execed@wharton.upenn.edu in your spam or junk folder, please take that opportunity to tell your mail program that it is not spam by hitting the “not spam,” “not junk,” or similar button, as that will train your program to whitelist it. Open your mail and click on “Mail Options” in the upper right hand corner. Select “Filters” (in the bottom left corner). Select the “From header:” rule, and add “contains” and execed@wharton.upenn.edu, which tells the system to put email with execed@wharton.upenn.edu in your inbox and not the bulk folder. Pick the “Add Filter” button. Select Automatically filter junk email. 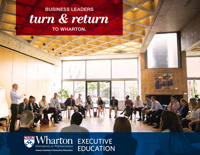 Under “Safe Senders and Recipients,” enter execed@wharton.upenn.edu and click the “+” button. In the “Add address or domain” dialog box, type execed@wharton.upenn.edu. Go to “Preferences” under the “Outlook” menu. On the “Safe Senders” tab, click the “+” sign. 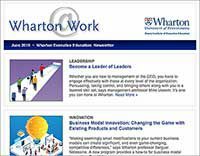 First, if an email from execed@wharton.upenn.edu ends up in your junk folder, highlight or open it and click “Not Junk” at the top of your screen. Go to “Mail” and then “Preferences” from your “Mail” menu. Go to the “Rules” tab.